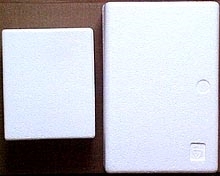 White Styrofoam Container ideal for shipping products that need to be kept cold. Can be used with small ice packs. Small box inside dimensions: 6"L x 4"W 3"D. Shipping dimensions:9"x8"x6"